For facilities looking to upgrade existing air operated single or double diaphragm pump systems, now could not be a better time to check out Wastecorp’s new air driven pneumatic Mud Sucker 3” Series. We are now into Mud Sucker pump month at Wastecorp and we are pleased to launch several new models and savings promotions for this wildly popular Wastecorp brand pump. What is An AOD – Air Operated Diaphragm Pump? An air operated diaphragm pump (AOD) is a type of pump that is either mechanically driven with an air motor or driven exclusively using an air. Usually a compressor or air hose line in the facility provide the power for the pump. These pumps are offered in single diaphragm versions or double diaphragm versions which are called air operated double diaphragm pumps (AODD). 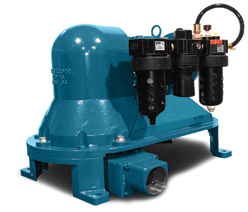 What Are Some Examples of Air Operated Diaphragm Pumps? The Mud Sucker 3FA-AP features a self-lubricating reciprocating air cylinder, 6” bore x 3” stroke, and adjustable solenoid. The air motor is mounted and supported vertically over the pump body, with a heavy duty 13” dia. Santoprene® diaphragm, 3” stroke length and patented contoured velocity channel to aid in pumping tough slurries. Download the fact sheet to learn more. What Can a Mud Sucker AOD Pump Be Used to Pump? The Mud Sucker air driven, pneumatic pump series is ideal for industrial wastewater pretreatment, lime slurries, ceramic slip glazing applications and much more (see a more detailed application list below).